Time to talk about the place where we spend most of our time: the BEDROOM. With 1/3 of our time sleeping, bedroom is closely connected to its owner from the Feng Shui perspective. That’s why creating good vibes in our bedrooms is a must for enhancing overall “Chi” of the entire house. And also because bedroom stands for marriage or intimate relationships, enhancing the Feng Shui in the bedroom will also cultivate a stronger and healthier relationship. That’s why we have rounded up this bedroom Feng Shui guide with doable tips that may help to bring more positivity and harmony into your house. Feng Shui is all about the balance of Yin and Yang, namely the “darkness” and “brightness” in plain English. Sleeping is a crucial component of Yin. Thus it requires more tranquility and stableness than the Yang parts of our home. So if you are currently moving in a new place, consider arranging the bedrooms in the back of the house where the activities are minimal. But being the “darker” side of the house doesn’t mean you have to keep your bedroom dark. Instead, natural light should be able to shed into the room to bring freshness and enhance the energy level. If there’s not enough light in your room, try to use curtains that are light-colored like pink or pearl. It will supplement the lack of natural light. In ancient Chinese Feng Shui theory, kitchen contains rage and disturbance. So if possible, the bedroom should not be near the kitchen or it may bring anger to you or your relationship. No doubt that the most significant furniture in the bedroom is your bed. 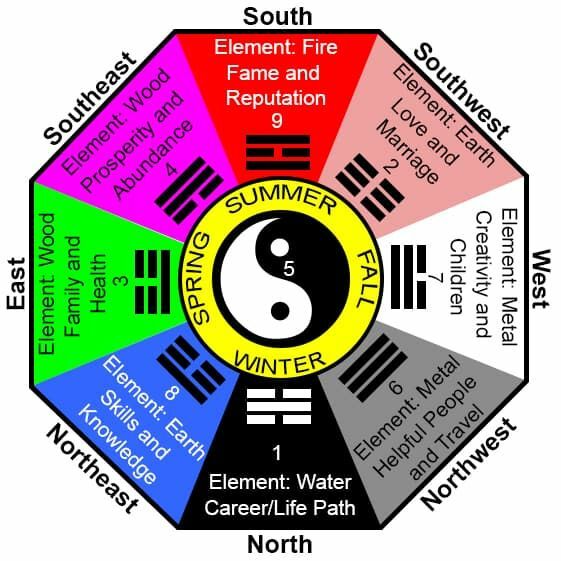 In Feng Shui, it is the core of Chi (also name “Qi”, meaning “the flow of air” in Mandarin). So the quality of your bed basically decides the overall energy level of the bedroom. To Feng Shui your bedroom, you don’t need to always use the most expensive products or decor. Instead, it’s all about embracing natural materials and staying organized. And it’s the same for our beds as well. Here are 3 tips you can make your bed more Feng-Shui-appropriate. That’s why it’s always a good idea to use natural materials in terms of furniture or bedding. A wooden bed frame along with a natural and organic latex mattress can already beat most of the negative energies flowing around. And it’s also super helpful for our health to keep everything natural. Always use linen that is made with the natural fiber like cotton or wool and is of the best quality. One very important element in Feng Shui is positioning. Because beds are the center of the room in Feng Shui, it should be accessible from both sides of the bed, especially for couples. In this way, the Chi of the room and your relationship will be kept in balance. Also, beds should not be placed parallel to the bedroom door. If you are into nightstands, putting a pair on each side of the bed to create the perfect balance. Electronic devices all, in some way, disturb the energy flows. It’s better to put your phone or laptop away from your bed, at least during sleep. Choose a decent alarm clock to wake you up instead to keep the disturbance to the minimal. Clocks made of quartz are the best choice in this case because quartz is a natural stabilizer and it also strengthens love and compassion. In the Feng Shui philosophy, each corner of the house corresponds with a certain color and element. Decorating your bedroom according to the its location would be a good idea to boost the energy flow. But if your bedroom is in the north corner of your house and black is too much for you, it’s always a good idea to use a neutral color or anything close to white. It’s the most harmonious color palette that will keep you calm and grounded. As Chi originally means “air flow” in Chinese, the circulation of air plays a major part in creating good bedroom Feng Shui. The air should always be flowing inside the room. As the air circulates, it also wash away negativities and unwanted energies. Thus it’s always a good idea to open the window from time to time and let the fresh air in. Bedroom represents intimate relationships and romance. In Feng Shui, the pink color symbolizes love and passion. In order to spice things up in the bedroom, try to decorate your room with small pink objects. We’ve picked some of the best blushy items that may work for your room as well. When it comes to enhancing the vibes with decor, crystals are definitely our top choice. Crystals can do magic in Feng Shui but as not all crystals are born equal, some of them are working especially well for rekindling romance and passion. The best crystal to place in the bedroom will be rose quartz. Well, it’s called the stone of love for a reason. But be aware, crystals, especially large pieces, are NOT suitable to put under the pillow. The energy they carry may be strong and it may affect the deep rest of your brain during sleep. So putting small pieces of crystal decor on the nightstand or on your room desk is probably better. Another thing that helps to ignite the fire between you and your spouse is the light. Warm color of lighting will help positivity and passion into the relationship. In this case, a Himalayan salt lamp is a great choice. It can not only light up the mood but also improves sleeping quality and the overall energy level. The wall arts add a touch of nature to the bedroom while maintaining a perfect balance. No crazy colors, just simple and natural illustrations. Bedrooms are relatively small compared to living rooms or dining rooms. Any big pieces with intense color might take away some energy of the owner. You will want you and your spouse to be the only energy center in the room. Any other things that read human will distract some of the energy flow. These are all the basis of Bedroom Feng Shui. Feng Shui does sound a little bit abstract, right? If you are trying to enhance your luck or health with Feng Shui, take small steps and try to feel the difference each time. If you do it right, sooner or later you will have an adorable bedroom filled with lots of love and passion.